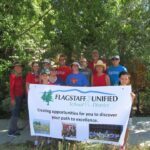 Supporters of the Flagstaff Unified School District and other educational groups took part in the 2018 Greater Flagstaff Chamber of Commerce 4th of July Parade. More than 20,000 spectators watched more than 120 floats, classic automobiles, horses and goats, dancers and a marching band on Wednesday. 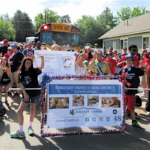 Supporters of the Flagstaff Unified School District, STEM City and other educational groups took part in the 21st annual Greater Flagstaff Chamber of Commerce 4th of July Parade. With an estimated 10,000 people lining the streets of downtown Flagstaff, educational, civic and a variety of other groups were able to put on a colorful show during the 20th annual Greater Flagstaff Chamber of Commerce 4th of July Parade. The event featured more than 100 entries. 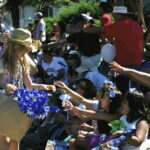 Volunteers for the Coconino Coalition for Children & Youth gathered early Monday morning to decorate their float loaded with more than 7,000 pinwheels to be handed out to children along the parade route. The event also featured the annual parade of schools led by youth carrying the Flagstaff Unified School District banner.